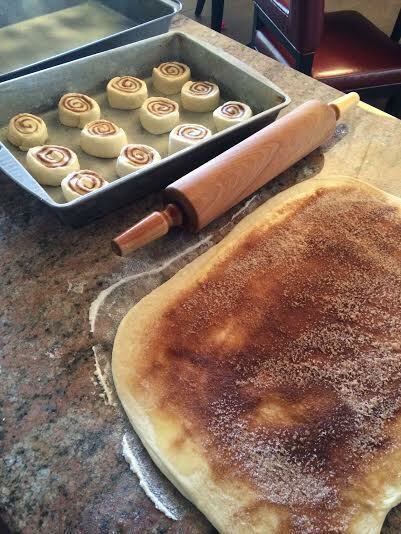 Cinnamon rolls are one of my favorite things. 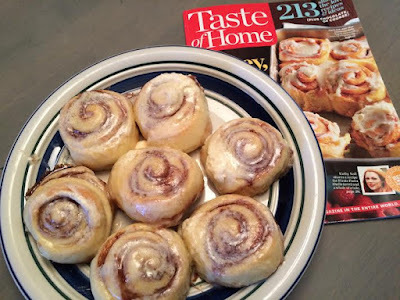 My usual recipe is more of a cinnamon "knot".....where you dip a rope of dough in butter and a brown sugar/cinnamon mixture, and repeatedly knot the dough to form a gooey nugget of deliciousness. I'm actually a bit surprised I haven't posted these, as they are my go-to recipe that I learned from my mom. 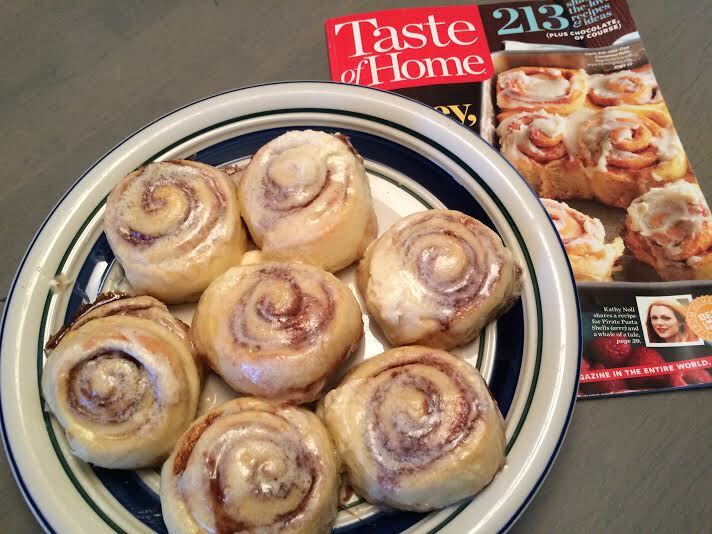 For a change though, I decided to try the Taste of Home recipe "Can't-Eat-Just-One Cinnamon Rolls". Every Friday, an ingredient challenge is launched as part of Taste of Home's Cook's Corner message board. I don't participate in this as often as I'd like, but this week the ingredient was Yeast. I was having people over for coffee this morning and I thought it would be a good chance to try a new recipe. -Mix yeast, sugar, and warm water together in a small bowl. Set aside. -Beat the milk and pudding together on low speed for approximately 1 minute. 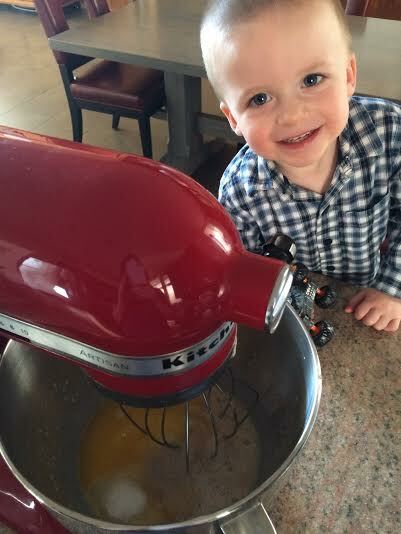 Let sit for an additional minute before adding the egg, melted butter and salt. Add 2 cups flour and mix on low to medium speed until smooth. Stir in remaining flour to form a soft dough. -Knead dough for 6 to 8 minutes (or about 4 to 5 in your mixer with a dough hook). Once it is smooth an elastic, place in a greased bowl and allow to rise, covered, for about one hour. I like to do this in my oven with the light on, so that it's draft free and slightly warm. -After the dough has doubled in size, punch down and roll into 2 rectangles (approximately 18x10 inches) on a floured surface. Melt butter. In a small bowl, combine the sugar and cinnamon. Brush half of the butter on each rectangle. Evenly sprinkle sugar over top and roll up, starting with the longer end. Cut each roll into 12 slices and place in greased 9x13 pans. Allow to rise in a warm place for 45 minutes to 1 hour. 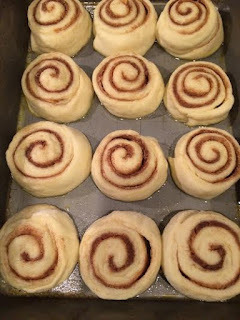 Bake rolls in a preheated 350F oven for 20 minutes. Beat the frosting ingredients together and spread on warm rolls.